Return of the son of the son of screaming Blues-o-mania (slight return). In this article we conclude our two-part Paul Gilbert lesson with a scary blues jam. This piece includes lots of fast scale lines and pentatonic phrasing. You will need a good picking technique and fluid legato. Try approaching it in small sections to start with. The rhythm part is more approachable for the moderate player and includes some excellent rhythm ideas. Welcome to the second part of our masterclass with US shred-meister Paul Gilbert. Last time, we saw Paul blasting over with a neo-classical edge, a style that Paul was renowned for in his Racer X days. This time, it’s time for our good friend – the 12-bar blues in A. If any of you have seen any of Paul’s instructional videos, you will know that he is a master of rapid pentatonic/blues licks. Check out his Jimi Hendrix tribute album for more of the same. Don’t forget, Paul is a ridiculous guitarist, so try to pick out licks and ideas that you could fit into your own style. The backing track will provide a great vehicle for your own improvisational ideas. Pay close attention to the phrasing, especially Paul’s use of string bending and vibrato. This section concludes with an ascending single string pentatonic line. Notice how he mixes both major and minor pentatonics to create a hybrid scale. He also uses the two scales to negotiate the chord changes. This section concludes with some major pentatonic phrases. Paul concludes this section with more licks based around A Dorian, A blues, and A minor pentatonic. Bars 21-28 include more pentatonic, blues and Dorian licks, plus a fast string-skipped pentatonic phrase at bar 23. Throughout this section it is important to keep things flowing; also check out more of Paul’s cool string bending. Bars 29-32 kick off with some fast legato lines based around E Mixolydian, plus fast pentatonic lines with chromatic embellishment. If you find this type of playing tricky, target each group of notes to the appropriate beat and practice at a slow tempo. Bars 33-36 introduce the break-down section and include wrenching bends and phrases based around A blues and A Dorian. Paul also performs a fast picked bending idea at bar 35. Bars 37-38 include yet more fast scalar patterns that fuse both fast picking and legato phrasing. Bars 39-40 kick off with an ascending pentatonic line. Notice how this run is grouped, as it should be played with a straight feel. Bars 41-44 include a classic Gilbert lick. Based around the major/minor blues scale, this lick features the same fingerings in both the positions it is played in. It is concluded with some fast two-handed tapping ideas. For ease of learning this lick, I have quantised it to each beat. Bars 45-46 includes some bluesy sliding double stops, performed with fast picking. Bars 47-49 see Paul playing more bluesy pentatonic licks. Look out for the pinched harmonic at the end of bar 47. Bars 50-55 include more three-note-per-string A Dorian licks, plus more pentatonic phrases. Look out for the muting in bar 52. Bars 55-56 conclude the main part of the tune, with a fast two handed tapping pattern that shifts up the G string. Bars 57-62 included more laid-back blues phrases over the tune’s outro. Take care with the pitch of the bends during bar 61. Bars 63-65 incorporate a tricky wide-stretch three-note-per string pentatonic pattern. Once again, practise this slowly to start with. Bars 66-71 concludes Paul’s solo with more Dorian/blues-style phrases. The end section should be played freely, so once you’ve got the licks under your fingers, go for it. Exercise 2 shows the rhythm part. The main riff is based around a standard I, IV, V progression in A, but also features a number of riff and chordal ideas. Phil also includes some great sliding chord voicings that should produce plenty of ideas for you to spice up your blues rhythm playing. Bar 33 introduces the break-down section. The rhythm playing here is pretty sparse, so watch your counting. This part concludes at bar 44 with a high register E7#9 chord. The outro is introduced at bar 57 and includes a second guitar playing some sliding sixths that outline the chord changes. The rhythm part concludes with both parts playing a separate line that makes uses of contrary motion. There are plenty of cool blues rhythm ideas here for you to get your teeth into, so study the part well. That’s it for now, but look out for more masterclasses coming soon. 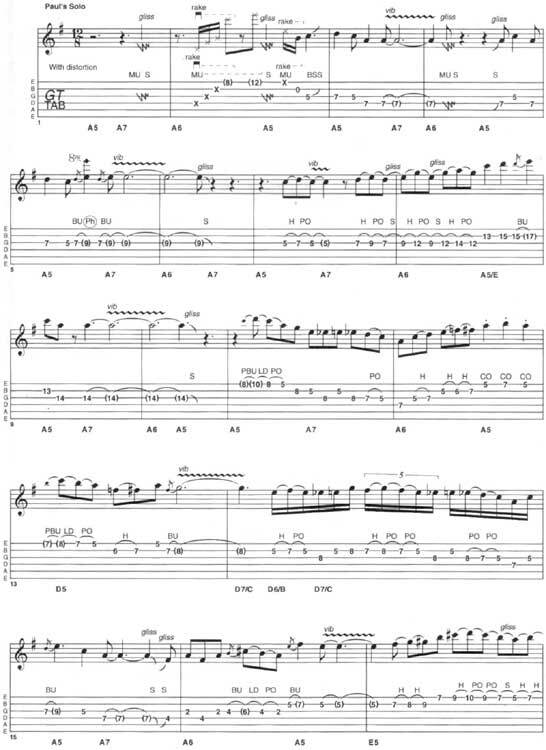 It’s a part of Paul Gilbert lesson with guitar tab and sheet. © 2012 - 2019 TabsClub Powered by TabsClub 42 queries in 0.519 seconds.